This 5-Ingredient Amish Easy Baked Spaghetti is an easy dinner recipe that your entire family will love! The one-dish meal comes together quickly on busy nights for simple, cozy comfort food! Happy Friday, friends! And happy first-day-of-September! 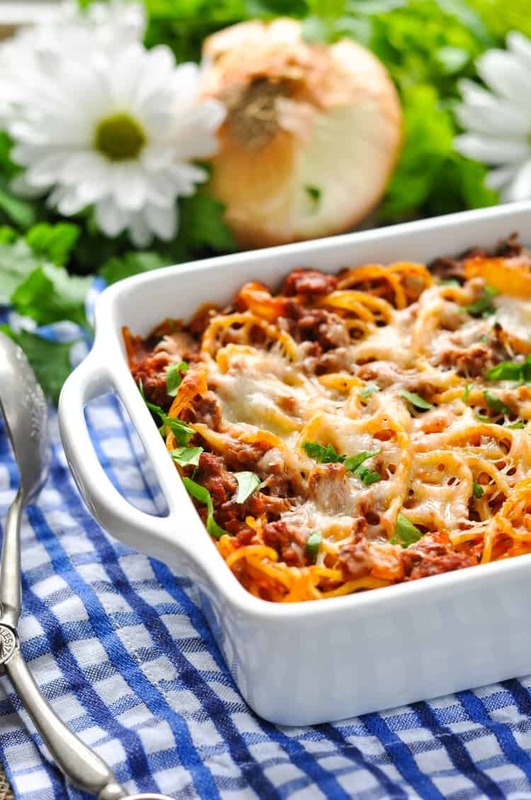 What better way to welcome the first month of Fall than with a warm, hearty baked spaghetti casserole? When we were at the Vineyard last summer with my parents, my dad and I made our annual visit to one of our very favorite spots on the island: a tiny little used bookstore tucked away in a neighborhood outside of Oak Bluffs. My parents have visited Book Den East for as long as I can remember (probably my entire life! ), but it’s only within the past few years that I’ve discovered the magic of the stuffy old shop for myself. I love the local literature that offers a taste of island culture and history, as well as the odd cookbooks that I would never otherwise encounter. On our most recent visit, I picked up an Amish church cookbook that has served as great inspiration in my own kitchen. There’s just something about the simple, wholesome recipes that fit perfectly with my style of cooking and my family’s tastebuds. 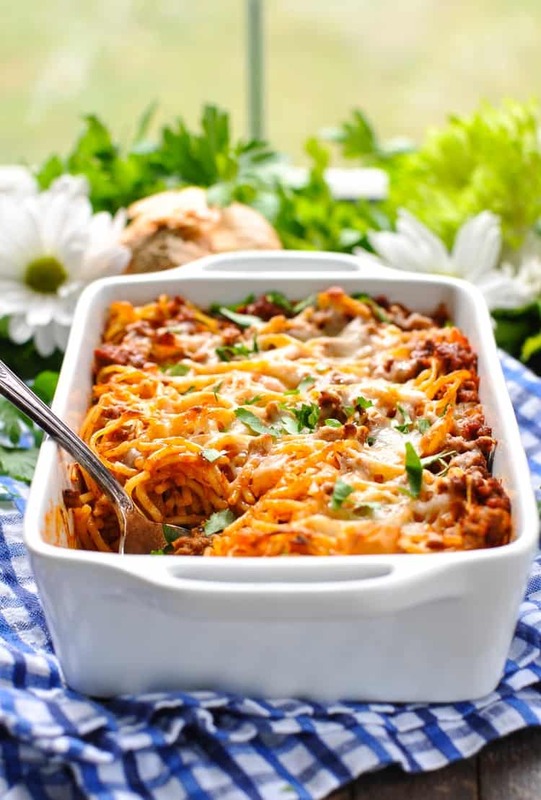 This Easy Baked Spaghetti is no exception! 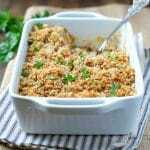 Amish recipes are old and simple recipes made with few ingredients but are hearty, filling and substantial. 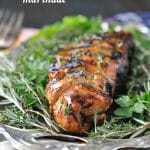 They are often easy to preserve and easy to prepare making them the perfect recipe for our busy lifestyles today. They’re also both economical and easy to make so on busy weeknights, recipes like these are my go to! 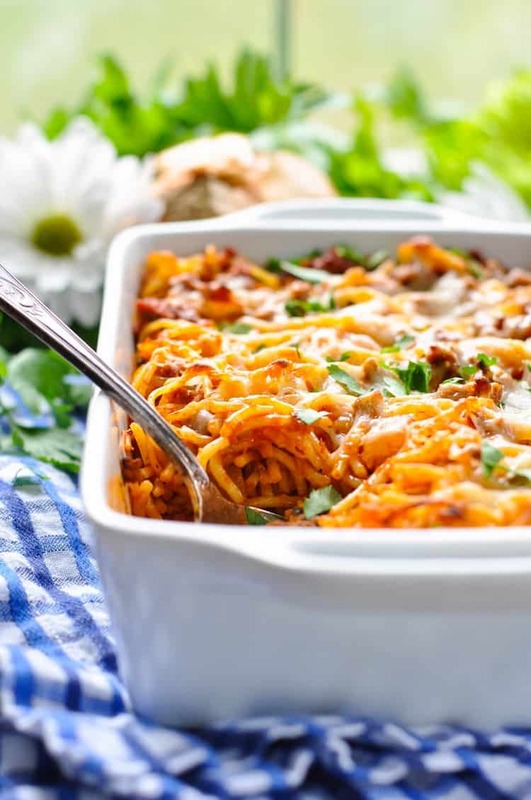 I’ve seriously never met a child who doesn’t love spaghetti, so naturally the Easy Baked Spaghetti recipe instantly jumped out at me when I was flipping through the pages of the used cookbook. 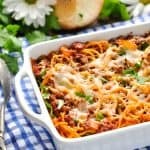 Yes…even in the heat and humidity of July, my mind was drawn to this cool-weather comfort food that I knew my boys would enjoy! 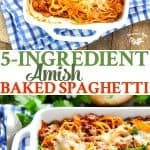 While the original Amish recipe for Baked Spaghetti includes many more ingredients (and a few extra steps), I took that inspiration and tailored it to my busy lifestyle. I’ve created a new recipe that utilizes just 5 simple pantry staples that I almost always have on hand, so that we can enjoy a classic family-friendly dinner on even our busiest weeknights. Best of all, there’s no last-minute fussing over the stove (or boiling water) when I have tired and hungry kids that demand my attention. Instead, I can prepare this casserole in advance and keep it in the refrigerator until I’m ready to bake it. Prefer to stash it in your freezer for a later date? You can do that too (and the instructions are below)! 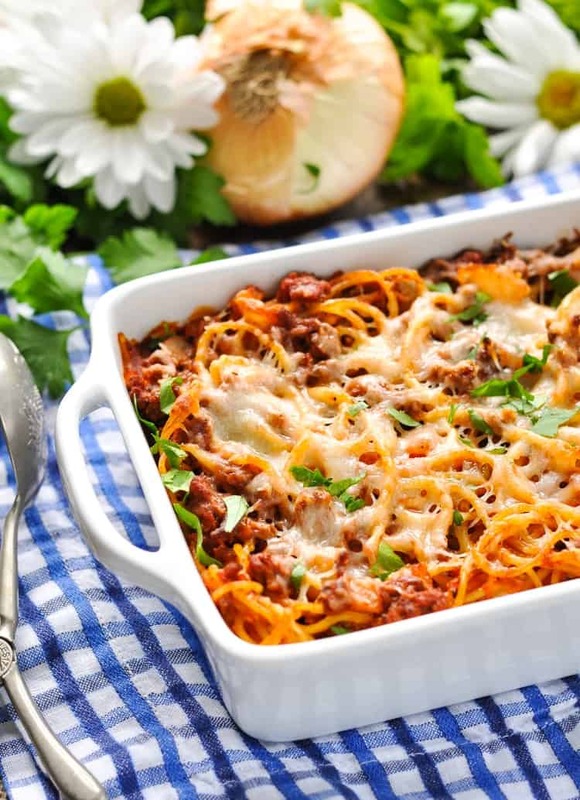 If you’ve tried this Easy Baked Spaghetti Recipe or any other recipe on The Seasoned Mom then don’t forget to rate the recipe and leave me a comment below! 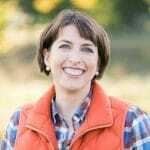 You can also follow me on Facebook, Twitter, Instagram and Pinterest to see what I’m getting up to. I bet that Amish cookbook is so fun to go through! This spaghetti looks amazing, Blair! It’s only 6:30am and I kinda want to dig into this for breakfast! 🙂 Love that it’s just five ingredients, too! Nothing wrong with some pasta for breakfast! 🙂 Thanks, Gayle! Pasta is the best! 🙂 I hope that you enjoy this, Betty! You said no boiling water was necessary for this recipe in your blog — but then the recipe states to cook spaghetti according to package directions which, of course, means boiling the water. I thought perhaps it was an option for make-ahead, but didn’t see that either. Just a little disappointed. I was tickled with the idea of not boiling water! 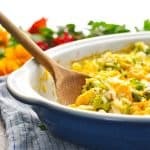 This is a great recipe to bring in the fall season. 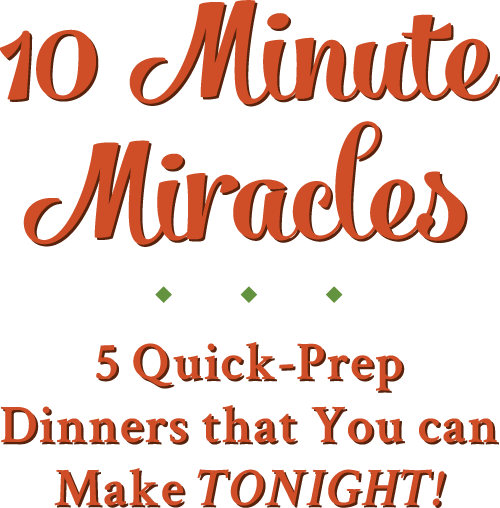 Love that you simplified the steps and made it easier to prepare. Thanks for sharing this. Thank you, Karl! You’re right — it’s so simple and cozy for the start of fall! Thanks for stopping by! 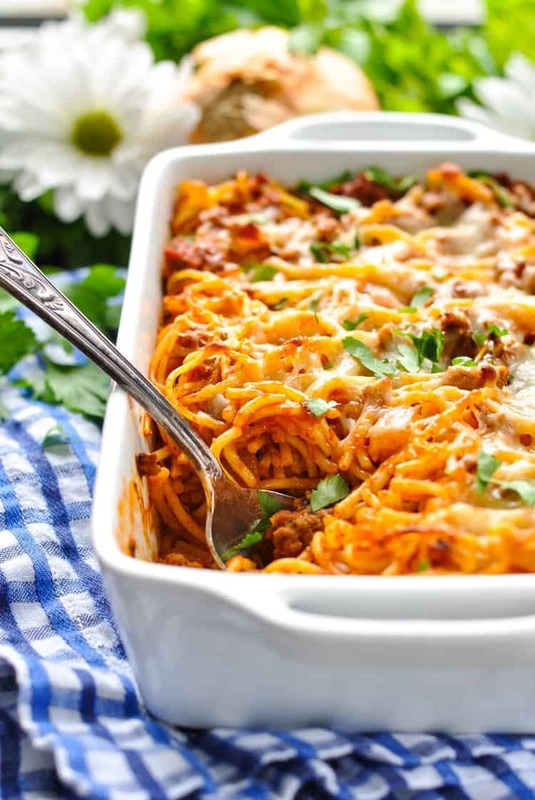 Baked spaghetti? So much yes. This is a staple that the whole family will love! This looks good as well as easy. I can make up a batch to have one for dinner and one to freeze in 8″ size, there are only two of us. Oh by the way my 6 year old grand daughter does not touch any spagetti, barely eats pizza. She will eat mac and cheese and raman noodles so there is still hope. Thanks for this great recipe. I’m cooking the family meal tonight and this is it. That’s great, James! I hope that your family loves it! I have leftover cooked aldonti spaghetti noodles. Will it work in this recipe? Hi, Suzie! Yes, the recipe requires you to cook the spaghetti before adding it to your casserole. 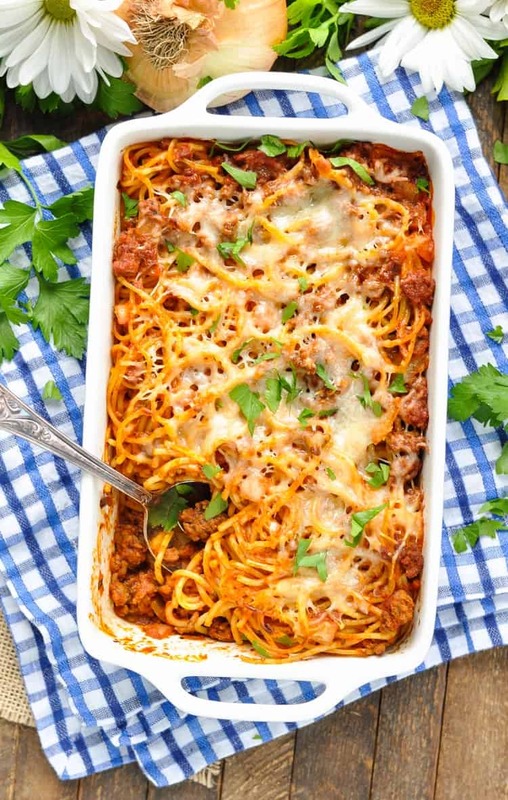 If you already have cooked spaghetti leftover from a previous meal, you can use that cooked spaghetti and just cut out an extra step! 🙂 Enjoy! Looks great and easy! I will tweak it to become a vegan recipe with vegan meatballs and vegan cheese. Thanks very much for the inspiration! That sounds like a great idea, Alison! Enjoy! Oh this looks amazing! 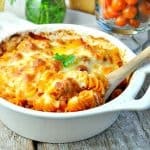 I love baked pasta dishes because they always seem so homely and comforting! A friend recommended this recipe to me. My mom made it for dinner tonight. It was so easy. She replaced a small onion with onion powder and it tasted great! I’ll be recommending it to my FB friends and family members. I’m totally drooling at this right now it seriously looks to die for! Thanks, Emily! It’s definitely a keeper! This is prepped (put it together last night) and ready to cook tonight! I can’t wait to see how delicious it is! !